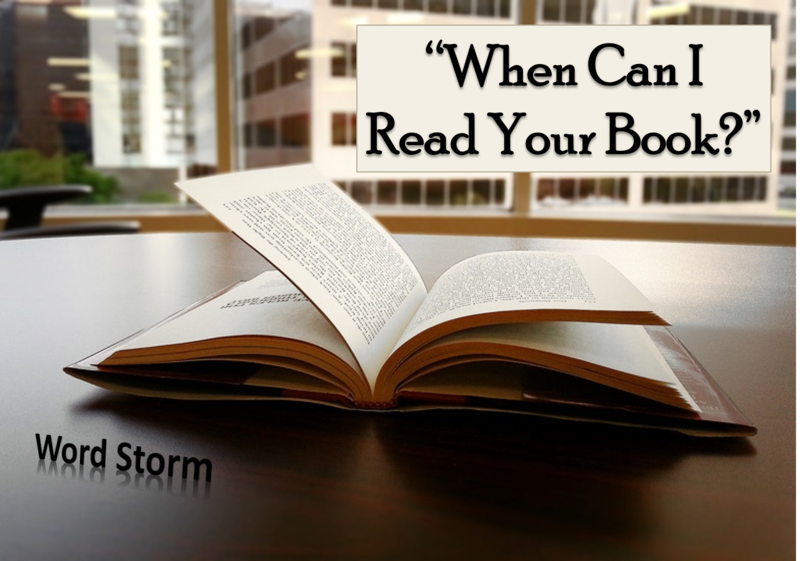 Word Storm: When Can I Read Your Book? Either way, one of the most common things I hear from friends is, “Oh, you’ve written a book! Can I read it?” One of two things can happen from here. In the case of finishing a rough draft, I’ll feel like cringing. It’s FAR from ready! In the case of a nearly finished draft, I might get frustrated with the over-eagerness of readers. After all, I can’t just hand out copies of my story EVERY time people ask to read it (unless that person is an agent/editor). That would be bad business. Something a lot of readers fail to realize is that writing is just that: a business. So before you ask a writer for a pre-release copy of his/her novel, consider in what ways this could impact the writer. Now, that’s not to say that a writer will NEVER send out pre-release copies. If you’re really eager to read a book before it’s published, you might serve as a beta reader, giving the writer your thoughts on the story in the earlier drafts. Or you could request a pre-release copy closer to the publication date in exchange for an honest book review. But what exactly can readers do if the drafts are nearly finished but not published yet? Notice the subtle difference? Including WHEN implies an expectation that the story will be available to read soon, and even if soon means 1-2 years, this is encouraging to writers. Leaving WHEN out implies that the because a writer has a story (not necessarily a published one) that writer has an obligation to allow EVERYBODY to read it. And saying, “No, you can’t read it,” or even better “Not yet,” can seem like a letdown for both the reader and writer. Put another way, consider this scenario: a baker who’s making a bread for his store. If somebody were to come in and ask him/her to taste the dough before it goes in the oven, “Can I have a piece?”, the baker will obviously say no. But if the person asks “When can I have a piece?”, the baker may reply with a given time to cook and cool. It’s similar (not the same) with books. Pre-published books, while they may be ready to be read before publication, they are not ready to be SOLD. Besides, suspense is half the fun! Please don’t harass writers if they’re caught between the pre-publication and post-editing stages. So, my answer to everybody’s question when you can read my latest novel ,Breaking a Thief, is soon. Not yet. But soon. I’ll keep you posted when I finally get a contract with a publisher. I’d like to say sometime in 2016, but it might be 2017. Either way, it’s sooner than it was yesterday! Thanks to all those interested in reading my work. Until my book releases, you can check out some of my short stories and poetry here. Aside from the premise and the novel itself, what would you like to read next about Breaking a Thief? The screeching is a must! I'm glad I'm not the only one who can be a little overprotective when it comes to big project. Thanks to college, I'm a firm believer in word precision and the subtle difference between can and when is very important. Thanks for your comment!